So here we are. You’re waiting for the next Wimpy Kid, you’ve read all of the Big Nates, you haven’t seen Jamie Kelly in YEARS, and there are still nine grueling days until Blood of Olympus comes out… WHAT TO DO? WHAT TO READ? Well, have I got the answer for you! Introducing… Life of Zarf, a new graphic novel series by Rob Harrell. It’s about Zarf (obviously), an ordinary, friendly troll middle schooler with hairy feet, giant ears, and a slight genetic temper problem. He is a troll, after all. 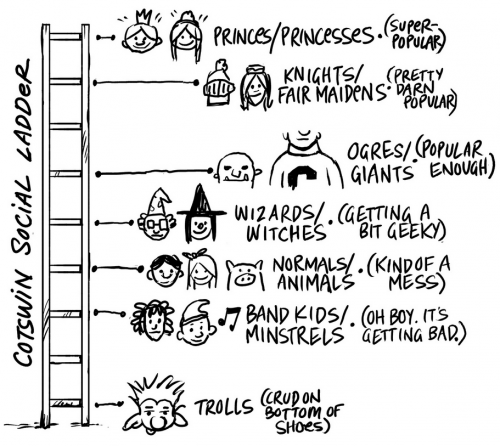 Zarf’s position on this totally unfair social ladder is not helped by the fact that Prince Roquefort just happens to hate his guts… but at least he’s got his best friends: Kevin Littlepig (descended from the Littlepig who survived the Big Bad Wolf’s demolition and feasting attempts) and Chester Flintwater (who aspires to be a court jester, but fails to ever make anyone laugh). Will — should — Zarf save Prince Roquefort if the snooty blue blood is stuck in quicksand? How will he deal with the angry bubbling troll blood which could make him rage out like the Hulk (but thankfully, does not make him green)? Who is the mysterious prisoner locked up in shackles in the dungeon? Will Chester, the future jester, ever get a laugh out of his crowd? 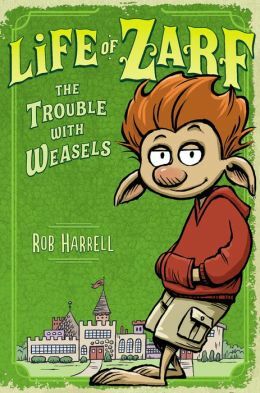 If you like fairy tale remixes and illustrated novels like Diary of a Wimpy Kid, you’ll definitely like Life of Zarf: Trouble with Weasels — hairy feet and all. Nancy is supremely impressed with the volume of Zarf’s hair on the book cover. Is it natural, or does he use some kind of special troll-hair product?